It is rare when I write this blog before 11 p.m., but this is an exception in many ways. It is also rare I discuss domestic fowl, as our work is specifically about native avian species. I promise, gentle blog readers, that this will not become a habit. I have reports yearly of Domestic geese "dropped off" in area ponds or lakes. 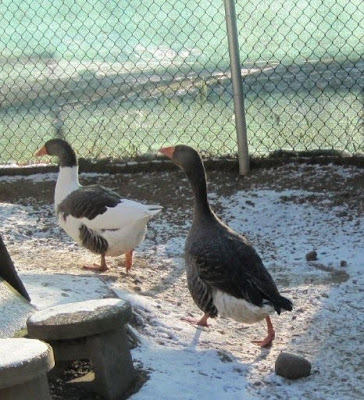 If there is anyone out there that can give these poor geese a home, even for the winter, please email or call me. 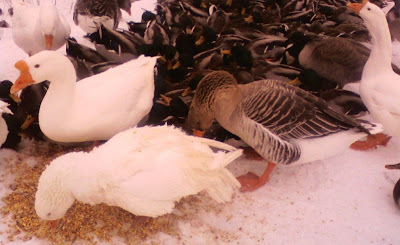 Domestics are captive-bred and do not have the ability to live and compete with wild geese in extreme temperatures. So how does this phenomenon happen? 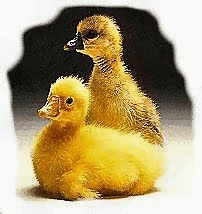 The geese are purchased when they are "cute" hatchlings. Once the goslings began growing, they are not so cuddly as in the weeks before. They develop annoying problems like being LARGE and eating a lot. The biologist in me feels the need to state the obvious, that being anything that eats a lot, poops a lot. The situation is exactly the same problem Humane Societies around the country see with kittens or puppies. People fall in love with cute little faces and tiny bodies of baby animals. They adore the little tykes, showering them with love and attention. Then, the little ones ( of whatever species) grow up! Once they are grown the "owners" tend to ignore them at best, or abuse them at worst. Somewhere in the middle is abandoning them. I say that only because abandoned animals can find homes, at least sometimes. I for one work hard to try to find places for the "dumped" animals, including the cats and dogs that people drop off by my home. I can only believe the "dumpers" deduce that because I obviously love animals, I will find good homes for them. We get an interesting mix here from cockatiels and ring-necked doves to three-legged dogs ( another story for another time) and cats. I do take many in, but our animals tend to live long and thrive. We can only do so much. With seventeen Bald Eagles and one hundred and fifty other wild patients currently at REGI, and a houseful of pets, my ability to take in any more domestics of any species is impossible. These geese need help. The current group I am aware of is in Medford. They are under the Hwy 64 bridge, which is where the only open water is. They are now no longer being fed since they are not in clear view of the public. That does not mean, however, that they do not exist. It only means people cannot see them and their problem as well as they could last week. They are starving and freezing to death and being killed by wandering dogs. They are domestic and geese like these have been raised in captivity since 1555. 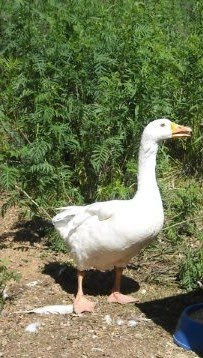 ( Wikopedia) The wonderful and gentle Toulouse Goose is originally from France and has been bred at least since the early 1800's. They are not wild, any more than your Persian cat! The thought of them being dumped on a pond, now frozen solid, is distressing, and not only for me. If anyone can help PLEASE call or email or just GO and get them. This is an urgent issue. We can address the broader issue of abuse and "dumping" of geese and other animals at another time. Through, in part, the great work of the Humane Society of the United States and local agencies, people finally understand the problem of abusing domestic animals and even farm animals to some degree, but avian species seem not to have reached the radar of most rescue facilities yet. These birds are intelligent and sensitive as well, and wondering what they did wrong, except grow up. Thanks. 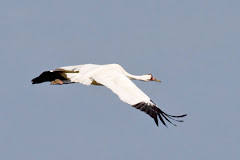 I hate to "dump" this on our readers but I am not able to go and get these birds. I want to but cannot.